Sometimes, things don't work out as intended. If you're dealt a poor hand, it's up to you to bluff your way out of it, which is exactly how Melissa Malady moved up in the world. She had been a nobody, a simpleton scraping to make ends meet from birth. But she was never satisfied with that. Through deceit, lies and pure determination, she began to move up in the world, burning bridges to further her own ambition and position in life. Friends quickly came and went, used like tools and discarded when they were broken and ceased to work towards her own ends. Where she didn't have the skill and knowledge, she pretended that she did until it was real, and that always gave her the strength to overcome any obstacle. Friendship was meaningless, people only used it to get what they wanted. She just made certain that she was always quicker to the punch. With her penchant for perfection and cutthroat tactics, she quickly moved up in the corporate world, while at the same time establishing her own underground empire under the pseudonym of 'Mascara'. It irked her to no end that idiots were at the reigns of the world, though she'd make a point of changing this apathetic reality. She'd see to it that the system was changed, that the weak and foolish would plummet to the earth, and only those with her ambition, her drive, her... Perfection, would remain. In order to get started, she set her sights on the dismal region of Morgen, intending to mordernise and develop the outdated locale through brute force business tactics. This in turn allowed her to establish both her corporate headquarters in Zweck, as well as a base for her villainous operations, although the naive locales of the nearby towns refused her efforts to buy land. She would have to 'persuade them' at some point. Though battles and competitions were an amusing sidetrack (And effective cover) from her true goal, Pokemon would give her the power to achieve what most would consider an impossible dream. They were nothing more than a means to an end. Attachment was for fools - Pokemon were a source of power and respect. Those that were strong would rise to the occasion and be admired, while the weak would fall to the gutter like the trash they were. Pathetic individuals without her talents, her unique drive towards superiority; well, they were laughably misguided. Still her followers and lackeys would serve a purpose until they were no longer needed. Those that wouldn't work under her boot... Well, she'd simply have to crush and relieve them of their beasts to use towards her own grand design. After all, they'd be far more efficiently used in her care. If evolution brought Pokemon so much power, and their true forms... Well, she'd see to it that mankind evolved as well. Though her life as Melissa of the Malady Corporation leads her to have to act more placid; under the cover of her alias Mascara and with her underlings: Team Purge; she shows no mercy to anyone that stands in her way. It was a beautiful day in the City of Schon: a pleasantly cool breeze, peaceful blue sky, and heavenly warm sunlight. And yet, even something so innocently enjoyable can be tainted. Shimmers of light reflected in a glint of extravagance, partially blinding nearby pedestrians as the perfectly shined limousine made its way through the streets of Schon, slowly but purposefully making its way towards its destination. Eye-catching in its lustre, the vehicle’s exterior was sharply contrasted by the pitch black windows, refusing to give any hint to who or what was occurring inside, and yet, anyone who was an anybody would know exactly who the pristine vehicle belonged to. There was no mistaking that anyone who crossed its path would have a strong view about the occupant – be that awe, annoyance, jealousy or detest. But none of that mattered to the occupant. What was important was that she was noticed. The persona of Melissa Malady needed every bit of attention she could get. All publicity was good publicity. Switching the way she crossed her legs, Melissa stopped her gaze out the window, deciding that it had been enough of a distraction already. Turning back to her secretary, she began listening intently once more, giving the girl her undivided attention. “So, like, you’ve got a board meeting call at 3, Document signings at 4 and 4:15, Jorgen has been requesting a resource allocation update, and uh, I have like, a report on Decklan…” The Secretary hesitated after the last statement, looking to meet her bosses eyes from over the rims of her narrow glasses. The loathing was immediately apparent on Melissa’s face as she sat up, looking at her with a deadpan expression. “And why would I care what that failure is up to, Julia?” Melissa asked, reaching to pour some more of her wine into her glass, though her eyes never left the girl in front of her. Melissa reached for her drink, swirling it once in the martini glass and giving it a sniff. The aroma was pleasant, but the flavour would be the true teller as to whether she liked this one. Sipping it steadily, she enjoyed watching Julia squirm out of the corner of her eye, unsure whether she was expected to speak more, or whether Melissa had even cared for her explanation. Odd. She couldn't seem to separate her enjoyment of the scene from that of her feelings of the taste. Perhaps she'd have to try this one again another time. Once she was satisfied that she’d made her 'precious Jewels' quite aware of their place again, she set the glass down, taking a moment to pull out a compact mirror and check her appearance. “Yes, yes, of course. I appreciate you taking the time to keep me up to date on one of my failures.” Melissa replied, knowing full well that the logic of Julia’s plan was sound. Even if there was ulterior motives there, it was important that she maintain her public façade. Unperturbed, Jewels continued. “So, he like, succeeded in winning his most recent match, moving up to rank 113. The battle was against…” Melissa listened vaguely to the full story, memorising key details so she knew exactly what to tell the press about what made her ‘proud’ about her ‘darling son’. Honestly, the whole thing had been a pretty foolish experiment, but alas, she was stuck with the repercussions now. When Julia had finally finished her briefing, they found themselves arriving at their destination, Schon City Stadium, Melissa dismissing her as she prepared herself to meet her public. As her driver moved to open her door, she stepped out into a glimmering of camera flashes and reporters, quickly finding microphones and the like thrust towards her face. Taking a moment to respond to a few of them, she began striding towards the stadium, taking in a little of the sights and people roaming about the grounds. 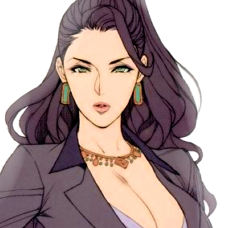 One of the staff had contacted her about potentially giving an exhibition show of her contest talent, and should there be enough of a crowd today, she’d certainly take that opportunity to win over some imbecile locals that would be enthralled by a dazzling show. After all, every person that came to love her was one less obstacle towards her goal.